The Balancing Frankincense, Lavender and Orange Beauty Balm is a luxurious treat – this can be used as an intensive moisturiser, as a cleanser or as a concentrating mask to be slathered on the skin for 15 mins and removed with a flannel. Frankincense is thought to have anti-ageing properties and is a favourite in the beauty world for its youthful affect! The healing properties of lavender are well documented – this is due to its anti oxidant and anti microbial benefits. This means it s perfect for hormonal break outs or when you need a skin pick me up after a late night. The zesty orange essential oil complements the frankincense beautifully, making this the must have stunning treat for your skin. 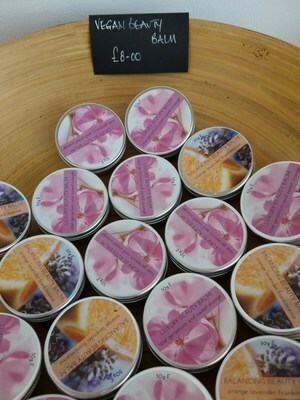 The Luxury Beauty Balm with Rose geranium and Sweet Orange can be used in the same way as the Balancing Beauty Balm. It again smells amazingly fresh, with a slight rosey floral aroma. Use it as an intensive moisturiser or for an rejuvenating facial mask. Cover the face with the balm and relax for 15 mins while the luxury balm goes to work. Maybe even read a book or even better meditate! Wipe off the redidual balm with a hot wet face cloth and enjoy. Added to this oil cleansing is definitely all the rage at the moment in the natural beauty world. We ve just taken this a step further. The theory stems from the well known scientific fact that like attracts like. So when you use oil as a cleanser the sweet almond oil in the balm attracts and dissolves unwanted oils from the skin. But (and this is the important bit) it does not strip the skin of its natural defences through harsh chemicals and foaming agents. Wet your face with warm water – no soap. Apply the balm gently with your fingertips and work in using small gentlE circular movements and the wipe off with a hot wet face cloth. Leaving your skin feeling dewy and supple…..
Rose Geranium is believed to be great as a relaxing, hormone- balancing essential oil.